The Creative Research Medals will be awarded April 18 to five ­faculty members for their outstanding research or creative activity within the past five years that focuses on a single theme identified with the University of Georgia. John Burke is a leader in the study of species in the Compositae, one of the largest and most ecologically successful families of flowering plants. The Compositae includes more than 40 economically important species that are grown as food crops or for medicinal, horticultural or industrial applications. 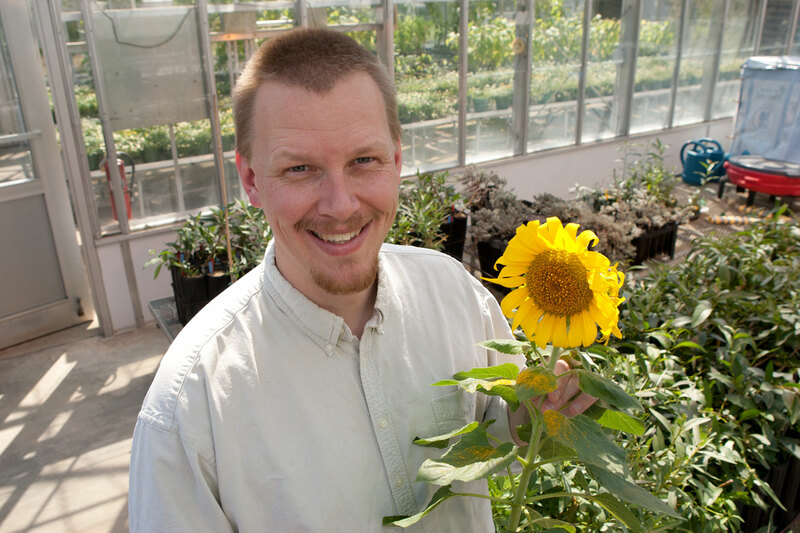 Burke’s research focuses in particular on sunflowers, which are the only major crop species to have been domesticated in North America. His work has shed light on the genetic basis of the transformation of weedy sunflowers into a useful crop plant and provided evidence that all modern-day cultivated sunflowers trace back to a single domestication event approximately 4,000 years ago. His lab also is interested in the genetics of floral development. His work on this topic went viral in 2012 when Burke and his colleagues published research describing the genetic mutation responsible for the unique sunflower variants painted by the famous post-Impressionist Vincent van Gogh. Chris Cuomo is recognized for her unique and groundbreaking interdisciplinary work on the epistemology and ethics of global climate change. In 2003, Cuomo formed a research team with physical geographers who study the history and resilience of permafrost. Drawing upon her more than 25 years of scholarship, Cuomo used research methods informed by feminist epistemology to integrate interviews with members of vulnerable populations into scientific research on landscape changes on Alaska’s North Slope. Her team’s interviews with Iñupiaq elders resulted in the creation of a community-based geographic information system that incorporates cultural information and memories along with geo-specific information about changes in the landscape. This unique blend of quantitative and qualitative data not only clarified the ecological changes in the North Slope region, but also produced excellent resources on the subsistence practices and gendered divisions of labor for contemporary Iñupiaq communities. Noel Fallows is a professor of Spanish in the Romance languages department and a Fellow of the Society of Antiquaries of London. He is a distinguished scholar of Spanish medieval literature and culture and an internationally recognized specialist on chivalry and military history in late medieval and Renaissance Spain. His recent book, Jousting in Medieval and Renaissance Iberia, is a major contribution to the understanding of the institution of chivalry, with emphasis on the culture and technology of jousting. The richly illustrated volume draws upon treatises, fictional works and an array of visual artifacts to trace the history and ideology of jousting practices. The work has been acclaimed as a masterful and original study, remarkable for its combination of rigorous textual criticism, historiographical and methodological discussion and careful interpretation of visual material. The book was the recipient of the 2012 La Corónica International Book Award for scholarship in Medieval Hispanic Languages, Literatures and Cultures. Daniel Krashen is recognized for his contributions to a branch of algebra known as field patching. Field patching assigns geometric shapes to complex algebraic systems called function fields. The method uses the tools of topology-an area of mathematics concerned with describing shapes-to more easily scrutinize the properties of equations in function fields. These are pure mathematical problems requiring great technical knowledge to understand and solve. While it is difficult to predict how or when discoveries in this field might translate into applied technologies for biology, physics or engineering, Krashen’s research creates an essential scaffolding from which applied technologies may emerge. These algebraic structures have deep underpinnings in the understanding of fundamental applications of mathematics from the symmetries and structure of space, time and matter, to the optimization of error-correcting codes in cellphone communication. Thomas Mote is one of the leading experts on climate change and the cryosphere-the portions of the Earth’s surface that are frozen. These regions of the planet are particularly sensitive to changes in climate, and Mote is celebrated for his body of research that has led to a better understanding of how the cryosphere is responding to a changing climate, amplifying climate changes and serving as an important factor in seasonal climate predictability. Because many of these frozen regions are inhospitable and difficult to access, Mote is recognized particularly for his inspired use of satellite data to track changes in surface melting on the Greenland ice sheet and then relating those changes to important components of climate variability. The data he accumulated and his many years of experience studying the cryosphere became particularly important in July 2012 when an extreme level of surface melt in Greenland captured the attention of scientists and international media.